This then is the true lesson: there is nothing romantic about love. Only the most naive believe it will save them. Only the hardiest of us will survive it. And yet, And yet! We believe in love because we want to believe in it. Because really what else is there, amid all our glorious follies and urges and weaknesses and stumbles? The magic, the hope, the gorgeous idea of it. Because when the lights go out and we sit waiting in the dark, what do our fingers seek? Who do we teach for? The story begins with the major characters (a group of siblings) as children, as they endure what they later dub “The Pause,” the three year period in the wake of their father’s death when their mother rarely left her bedroom and they were left to fend for themselves. They are all thrust into roles which arguably alter their personalities in major ways for the rest of their lives, with the younger siblings’ sense of security shaken and the older siblings dealing with the additional burden of being forced into a parental role. The relationships between the siblings were one of the big highlights of the novel, with their familial bonds waxing and waning over the years and being tested in various ways. The story itself… sometimes lost me. For starters, I didn’t entirely understand what Conklin was going for with her choice of framing device, as it didn’t seem to add much to the story. Fionna’s life story is told in retrospect from a somewhat dystopian future. She has become a world-famous poet and is speaking at an event and reminiscing on her life. Not a lot happens during the course of the events of the framing device, but just enough occurs that it leaves the reader expecting the focus to shift to the later timeline at some point. But there’s no follow through, and in the end I was left feeling like the story would have lost nothing if it had all simply been told in past tense from Fiona’s point of view without the framing device. My second issue with this book has to do with a whirlwind romance that occurs for one of the characters when they are adults. I don’t want to give any spoilers, so I’ll be vague here, but suffice it to say that the character in question has as lot of problems and meets someone who is equally troubled. The way the romance plays out seems unrealistic and optimistic to a fault, in a way. It’s cut short for reasons I won’t spoil, but it seems as if Conklin wants us to believe that, had it not been for that, this would have turned everything around in that character’s life. And, despite the brevity of the relationship, it’s absolutely, 100%, for sure true love. Can a good relationship and support system help someone who is determined to turn their life around do so? Sure. Do I feel it was “earned” in this novel? No. Conklin seems to want us to buy into the pure potential in this relationship as some of the other siblings do, when the whole thing felt like an impending disaster to me. Overall, I thought this was worth the read, despite the issues I had with it. 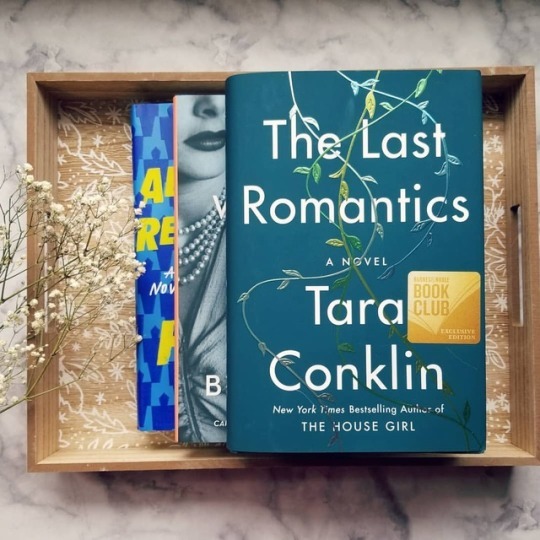 Have you read The Last Romantics? Please share your thoughts in the comments! 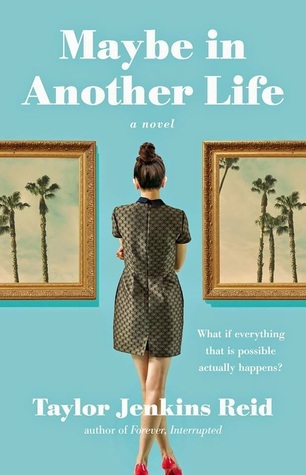 What do you think about the title of the novel in relation to Fiona’s blog of a similar name? Why do you think Conklin made this choice? Let’s discuss! Jodi Picoult was one of my favorite authors back in high school; I still vividly remember staying up late to read My Sister’s Keeper and crying my eyes out. As I’ve gotten older, I’ve started to find her books a bit too formulaic and found myself gravitating away from them. But there was so much hype around the release of A Spark of Light that I decided to check it out. Unfortunately, my experience with this book was rather underwhelming. Let me start with the structure: the timeline is backwards. Why? Good question. It doesn’t feel like it adds anything substantial to the story. When Megan Miranda did this with All the Missing Girls, I didn’t care much for it then either, but at least it had the function of placing a big reveal late in the novel which happened chronologically early. I’m not sure what Picoult is going for with this other than trying to make it different for the sake of being different, but it just made it unnecessarily difficult to follow at times. I liked that Picoult made a solid attempt at portraying varying viewpoints, although I think she fell a little flat in this regard. The writing seemed to suffer when she was portraying a viewpoint that wasn’t her own; consequently, some characters’ arguments fall rather flat and don’t always seem to ring true even in their own heads. The father-daughter relationship was probably one of the biggest strengths of the novel. Hugh McElroy, the hostage negotiator, doesn’t realize his daughter Wren is inside the clinic when he first makes contact with the shooter. I think the uneasy and sometimes secretive nature of the relationship between a father and his teenage daughter will feel familiar to a lot of readers. 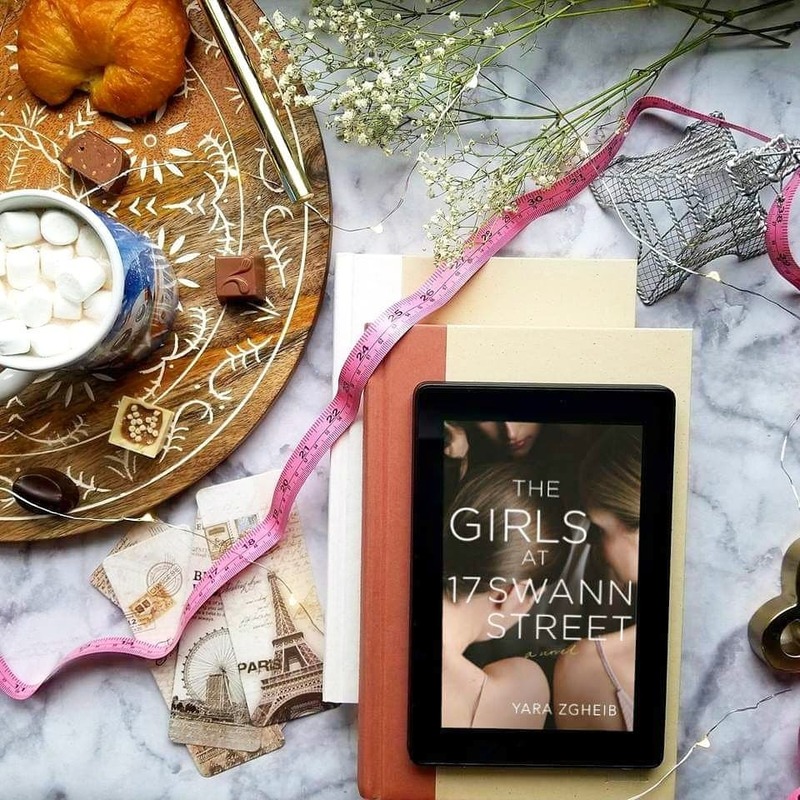 Wren loves her father, but there are some things she could never tell him, and needing birth control goes at the top of that list. Overall, though, I think the biggest drawback for me was that facts about abortion and musings about abortion rights took up what felt like a disproportionate amount of the book. It’s not that I have an issue with that subject matter; I read collections of essays about feminism on a semi-regular basis, so I obviously willingly encounter this topic often. Given what I gathered about the story from the blurb and the site of the hostage situation, I obviously expected these themes to come into play, but I did not expect them to overshadow the rest of the story. The events felt very secondary here, like a mere vehicle to insert rhetoric. Basically, it ended up not feeling much like a novel at all. Thank you for reading! 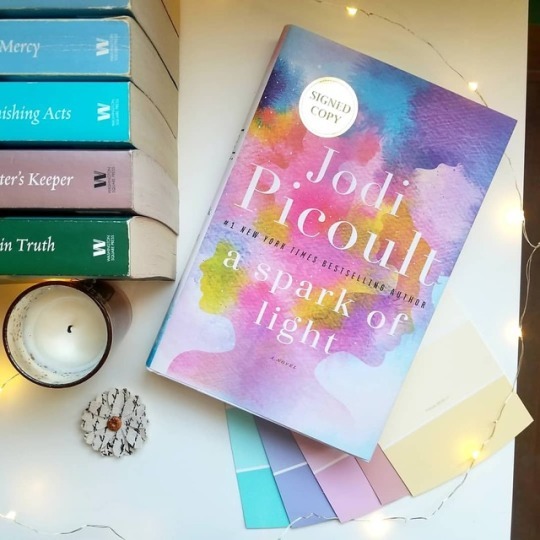 Have you read A Spark of Light or any of Jodi Picoult’s other work? Please share your thoughts in the comments! Britt-Marie Was Here was my second book my Fredrik Backman, the first being the wildly successful A Man Called Ove. I was a bit surprised by the striking similarities in themes between the two books, even considering that they both come from the same author. Ove and Britt-Marie are both older protagonists struggling to cope with a fundamental sense of loneliness for the first time in their adult lives. They are both uptight curmudgeons who find love and meaning in places they didn’t expect, finding themselves fundamentally changed in the process. That being said, Britt-Marie Was Here is very much its own story. Britt-Marie is not dealing with the death of a spouse, but with the dawning realization that she is not being treated the way she deserves. After years of marriage, after devoting the bulk of one’s adult life to a partner, what a terrifying prospect: it’s all been all wrong. Fundamentally, irreparably, wrong. 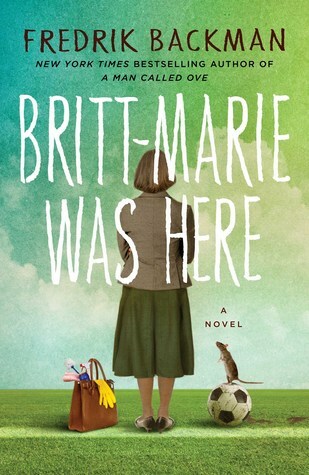 Britt-Marie packs a suitcase, leaves the home she’s shared with her husband, and sets out to find a job after spending her life as a homemaker. This brings her to Borg. Britt-Marie obtains a position as a caretaker of the rec center, where she meets a colorful cast of characters who have more to teach her than she could possibly guess. The most important lesson she must learn is this: it is never too late. It’s never too late to turn around a football match, to make new friends, to visit the city you’ve always wanted to see… to stand up for yourself and realize that a spouse who doesn’t value you doesn’t deserve you. Britt-Marie’s story is told with the charming blend of humor and poignancy which made Backman’s A Man Called Ove such a success. Thank you for reading! Have you read any of Backman’s work? Please share your thoughts in the comments! Fates and Furies is the story of Lotto and Mathilde’s marriage, and is told in two parts: the first half is told primarily from Lotto’s perspective, followed by Mathilde’s perspective in the second half. The halves are remarkably different in tone. Lotto’s chapters reminded me somewhat of Tin Man and The Book of Speculation. There is an odd, dreamy, rambling quality to Lotto’s musings. To be honest, despite my overall positive feelings towards this book, I didn’t quite care for Lotto’s half. This is nothing against the writing, as Groff’s style is delightfully weird and evocative. My issue was with Lotto as a character; he is, in short, a jackass. He is painfully a self-absorbed playwright and loves Mathilde deeply only in the sense that he views her as a possession, and Lotto loves his toys. It’s also extremely evident even before reaching Mathilde’s POV chapters that Lotto views her through rose colored glasses in a big way. He is deeply in love with the idea of her, while blissfully unaware that the reality of her is a complete mystery to him. I adored Mathilde. I’m not sure I was supposed to like Mathilde, but she was honestly the highlight of the novel for me. She is burning with anger and resentment. Which is not to say that she doesn’t love Lotto, but she is realistic about his flaws and cognizant of how little he really understands her. Mathilde had me thinking of Gillian Flynn protagonists, (think somewhat less Gone Girl and more Sharp Objects and Dark Places) with a dark past and righteous anger. They had been married for seventeen years; she lived in the deepest room in his heart. And sometimes that meant that wife occurred to him before Mathilde, helpmeet before herself. Abstraction of her before the visceral being. I had reservations about this novel early on; getting through the first half was definitely worth the payoff, in my opinion. Looking at other reviews of this novel, they are extremely mixed with very few people seeming to fall in the middle; you will adore this book or else you probably won’t finish it. Either way, it’s certainly an experience. Thank you for reading! How do unlikable protagonists impact your experience with a book? Do you need to like the protagonist in order to enjoy the book?